With the invasion of the military base and the parallel invasion of Naha city occurring at the end of last episode it was clear that this week Magical Girl Spec-Ops Asuka would be focused on the battle at hand. What follows is a fairly scattered affair with the audience jumping from one scene of the battle to another and seeing Tamara and Mia in action at their respective locations as well as following the actions of various soldiers and Nozomi and Sayako in amongst the fight before we finally get down to business in the bunker with Rapture, War Nurse and the main villains of this fight. While it is a scattered affair frantically jumping from one point where the soldiers are being beaten back to another, interspersed with civilians fleeing and dying and ordinary police being incredibly heroic before dying, all of this cut with scenes of the military commanders glaring at their screens and musing about potential strategy, it works really well because the set up for this fight was put in place last episode. Even though the overall motives of the villains is still unclear, making that the weakest link in the whole series, the basic parameters for this sequence were clearly laid out and the target of the General in the basement was pretty straight-forward, even if it turns out they were after something the general had rather than the general herself. Action sequences in this anime remain very entertaining to watch with a real sense of pace and movement about them. It makes getting screen caps kind of difficult because of the amount of motion blur at times but at the same time, watching the sequence it is very solid portrayal of a frantic fight sequence. It’s also fun watching the transition between the soldiers and their standard tactics compared to the Magical Girls who are almost a whole army on their own and have their own way of fighting. While characterisation gets put to the side for a large majority of the episode, Asuka still manages to deliver a decent effort at remembering that she was traumatised by the previous war and has yet to really accept that she’s back involved with the conflict. While many an anime hero would have committed to fighting and then never mentioned their trauma again, Asuka is wearing hers on her sleeve and it really is only Kurumi’s presence at her side while they wait that keeps her grounded and prevents her from breaking down entirely as they listen to the sounds of battle and dying over the radio. 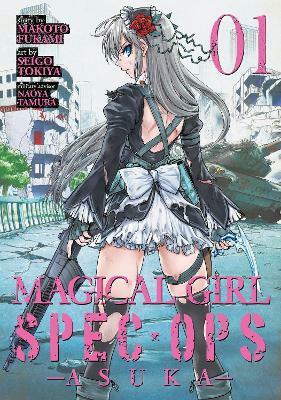 Magical Girl Spec-Ops Asuka remains a fairly decent viewing experience and while it has at times pushed the violence a little further than some people would like, its been delivering a reasonably compelling story and it seems to be heading to a decent climax. Now whether or not we get a decent end point or are left hanging is really all that’s left to find out in the next two episodes and that could really change my overall opinion of the show. While I’m not the biggest manga reader, I was kind of looking forward to this one having read some fairly positive reviews. How does this gender bending tale of Alice in Wonderland go? There’s nothing overly original about reworking the classic Alice in Wonderland. Even Ouran High School Host Club had an Alice episode thrown in. However, my issue with Wonderland inspired tales remains the same; too many of them rely on people just accepting weird things happen in Wonderland and don’t really consider how they might make that setting believable other than telling us it is Wonderland. Are You Alice? very much fell into this camp of stories that introduces characters that are given names connecting them to the original tale, but little is done outside of that to establish their character, background or motive. It is like the write feels you can short-cut all the things that would help the audience connect with a character simply because they are the Hatter or whoever and of course we should know their nature. However, that leaves us with a shallow impression of characters. They wear a facade similar to something we know but they undeniably are acting in different ways in a narrative that actually is interesting, but we’re not given the time to establish anything in its own right as they want to jump into people doing things without providing context. And maybe that works for some people. They’ll happily just nod and accept the setting as Wonderland and the base starting point for all characters is the established trope that we’re all familiar with. For me though, it was an ongoing issue while reading this. The Alice but not Alice vibe permeates everything and while I actually like the idea that accepting a name is the same as accepting a role and the journey the ‘Not-Alice’ is on, I never really clicked with anything happening in this volume. It’s also visually pretty ugly. Not the character designs. They are quite nice and clearly some time and attention went into them. But backgrounds, especially the streets which we spend a long time walking up and down, are all kind of basic ruled lines and while the characters are suitably zany given the setting, Wonderland itself is not portrayed in anyway as being ‘wonderful’. So this series is going to get a pass from me as I don’t really intend to continue on. I am really curious about how the rules work and about the Alice’s that have come before, and even the White Rabbit, but there were too many things that didn’t work for me in this series to consider reading on. If you’ve read it, I’d love to know your thoughts. Okay, I went in pretty blind but essentially the set up here is that there’s a whole bunch of hitmen and organisations operating within the town and then there’s apparently someone who specialises is killing hitmen. Don’t ask me what the title means. The individual words make sense but what it has to do with the show other than the location, I don’t know. And here is another entry into the ensemble cast dark and violent modern urban crime story. While there aren’t massive numbers of these there are a few now and for me they are a bit hit and miss. I’m not a huge fan of such a large cast because it usually makes it harder to get an idea of who is who (and after watching the first episode of this I can remember maybe two names and I’m not even sure if we got names for some characters). 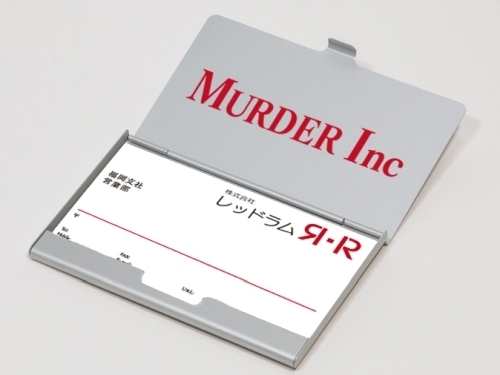 Yet, I have to say this was a pretty interesting first episode. We move through four main focuses with the guy dressed as a girl who clearly has some tragic backstory involving a younger sister taking up a large chunk of the start and finish of the episode. We also have someone who I think is a private investigator, though time will tell, who is looking into the mayor (guy running to be mayor’s) after a detective was murdered. We have the staff working for the mayor cleaning up after his son’s idiocy. And lastly we have some newbie hitman who quickly gets himself in over his head. So despite the large number of cast members, this episode didn’t feel too disjointed as there are clear links between the stories so far and characters seem to be crossing paths fairly quickly so hopefully we’ll get to know the key players in the next few episodes. Outside of that, the pace is quick but not rapid fire, there’s some violence and few scenes clearly intended just for shock factor but after the opening scene there wasn’t as much as I expected there to be. Character designs are quite nice and are distinct enough to recall which character is which and the backgrounds are all quite nicely done. All and all, for a show I hadn’t heard of and had no expectations for, this was quite a nicely done introduction and I’m looking forward to more. So I am not confused about the plot anymore. I was seriously over thinking this under the assumption that there was some deeper meaning to any of it and once this episode thoroughly convinced me that this was not the case everything kind of fell into place. The issue being that what I’m not looking at is a plot which is rivalling Hand Shakers for being ultimately completely pointless. Now that is not to say that this couldn’t somehow turn things around and maybe show that there was some actual thought put into this, but so far evidence suggests that this is a concept focused on a highly adolescent version of what might be cool and not an actual well thought out or developed plot. But hey, if you just want to see glowing characters beat each other up and throw trucks and each other and generally cause chaos, you might genuinely enjoy the mess that Dies Irae continues to be. I, unfortunately, am stuck in the same space I was with Hand Shakers in that I really don’t like this show but that small chance that it might, just somehow, pull off some sort of amazing twist is going to make me watch it through. Expect more hate as this series continues.